See also: A series of ISO paper sizes; B series of ISO paper sizes; C series of ISO paper sizes (envelopes); RA series of ISO paper sizes; Japanese paper sizes. Most historical series of paper sizes are not rational, in the sense that there is not a consistent mathematical relationship between sizes the way, say, there is in a modern series of bolt sizes. Attempts had been made at such a series—for example, by the French during the Revolution—but they did not take hold. 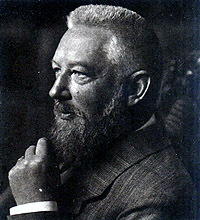 At the end of the 19th century, the Nobel Prize-winning German chemist Wilhelm Ostwald (1853 – 1932) proposed a series of paper sizes in which the base size was 1 centimeter by 1.414 cm, and additional sizes were defined by alternately doubling the previous size's length or width (1.41 × 2, 2 × 2.83, 2.83 × 4, and so on). The somewhat surprising preservation of the proportions is due to Ostwald's choice of the ratio 1:1.414 for the width and length of the base size. 1.414 is the square root of two. You can see how the square root of two enters this by setting up an equation that says the proportions of the old and new size are the same, and solving for the ratio. Ostwald's series of paper sizes never caught on, however. A key insight came to Walter Porstmann (1886 – 1959), a former student of Ostwald working at the Normenausschuss der Deutschen Industrie: paper sizes are basically a matter of area, not linear dimensions, and so the base size ought to have unit area instead of a side of unit length. For his base size he choose a sheet with an area of one square meter. Using the 1:1.414 ratio made the sheet 841 millimeters by 1189 millimeters, rounded to the nearest whole millimeter. This is the size now known as A0. Instead of creating additional sizes by doubling, additional sizes were defined by cutting the previous size in half, which is much more like what happens to real sheets of paper. In August 1922 the German standards organization published a standard (DIN 476) developed from Porstmann's ideas. Unlike Ostwald's, this series of sizes became popular in Germany, particularly for technical drawings. Other countries began to adopt it: Belgium (1924), the Netherlands (1925), the Scandinavia nations by 1930, the USSR (1934), Italy (1939), and so on. In 1961 the International Organization for Standardization published recommendation ISO/R 216, Trimmed sizes of writing paper and certain classes of printed matter, essentially adopting the DIN standard for the A series. A formal ISO standard was issued in 1975 for trimmed sizes of writing paper for administrative, commercial, and technical use, and for use in forms, catalogs, and so on. The standards do not apply to newspapers, books, posters, and similar printed materials. Writing paper and certain classes of printed matter--Trimmed sizes--A and B series. Last revised: 23 August 2007.